Almer Croix looked as if he had been stuffed in a sack of bruiser beetles and shook. Well, that’s what riding a titanium sphere rapidly to the surface with no restraints or padding did to a man. He was only a few minutes out of the hyperbaric chamber, was still be checked over by a doctor when Inspector Considine wrenched open the hatch door and stepped inside. “I’m not finished,” the doctor, a thin man as pale as his coat said, looking up from a suture he was applying to a gash on Croix’s brow. His huge eyeglasses made him look insect-like. “Take a break, Doctor,” Considine said, taking the seat across the table from Croix. The doctor finished the suture and Considine and Croix watched each other quietly as he did so. Croix was a sickly looking bugger, even for a grit-breather who had gone through what he had. He had a topsider’s red eyes, and he coughed now and then, but there was something else. A sunken-ness to him. He looked deflated, dried up, his cheek bones very visible beneath his bruised and slashed skin, his bloodshot eyes deep in hollow sockets. His sparse hair was leper-white, though he was not as old as Considine. The doctor stood up to pack his instruments. “You can leave them, Doctor. I’ll look after them,” Considine said. The doctor looked at Croix and reluctantly went outside. When the door clanged behind him, Considine leaned forward. Croix stared and coughed again. Croix looked somewhere past his shoulder, and his head leaned to one side, animal-like. Was it possible he was suffering some ill effects from his ordeal? Did he have a concussion? Maybe he should have let the doctor look him over more. The story was the same all over. 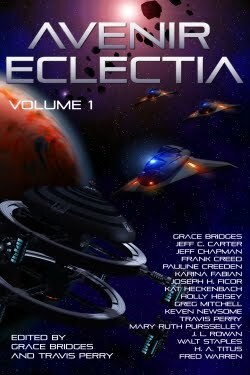 Shebans and Carlston’s Covers wanted to get down to Eclectia. Topsies wanted to get below sea. Everybody wanted to get to Avenir. But even on Avenir there were divisions between the decks. He knew. Nobody was ever happy where they were at. Almer was looking at him, almost through him. “You’re not from Zirconia, Inspector,” he rasped in his gravelly voice. No point offering him a cigarette. Topsies smoked from the day they were born. This time Considine said nothing. Croix leaned in, the disinterested eyes in his ravaged, battered face suddenly alight. Great opening line: "Almer Croix looked as if he had been stuffed in a sack of bruiser beetles and shook."